Cazitel Plus Worming Tablets can be given directly to your dog or disguised in food. Available in pork flavour. The recommended dose rates are 15 mg/kg bodyweight febantel, 5 mg/kg pyrantel (equivalent to 14.4 mg/kg pyrantel embonate) and 5 mg/kg praziquantel. This is equivalent to 1 tablet per 10 kg bodyweight. The tablets can be given directly to the dog or disguised in food. No starvation is needed before or after treatment. To ensure administration of a correct dose, bodyweight should be determined as accurately as possible. Each tablet contains 50 mg praziquantel, 50 mg pyrantel (equivalent to 144 mg pyrantel embonate) and 150 mg febantel. Treat all animals at the same time to reduce the chances of reinfestation. Consult your vet if you feel that the worms haven't cleared and you are considering repeating the treatment. First time using these as always used drontal but they were out of stock so brought these instead dogs took them no problem just crushed them up and mixed with wet cat food dogs eat em up easily were they would spit drontal tabs out. 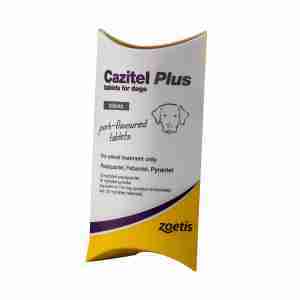 I have used Cazitel plus dogs for 4 years with no side effects, it just does it's job, and does it well. I wrap the tablets in cheese, and "Gulp" it gone. Excellent product, and its approved by my vet.